East of the stretch known as “The Boaty”, the canal crossed King Street. In 2013, if you peer over the stone wall to the left of St Andrews House, all you can see is a narrow water course emerging from a culvert and running alongside the backs of gardens in The Lane. The remains of the canal flow under King Street through culverts created in the 1880s. Although the water is shallow, the channel is deeply set – more than 1 meter below ground level. The road is level and there are no signs of a bridge, either on the masonry of the house immediately adjoining the course of the canal or the stone wall over the culvert. There has been much debate about whether there was a bridge or a ford. If there was a ford, there would probably have been a footbridge over it. The documentary evidence is confusing. 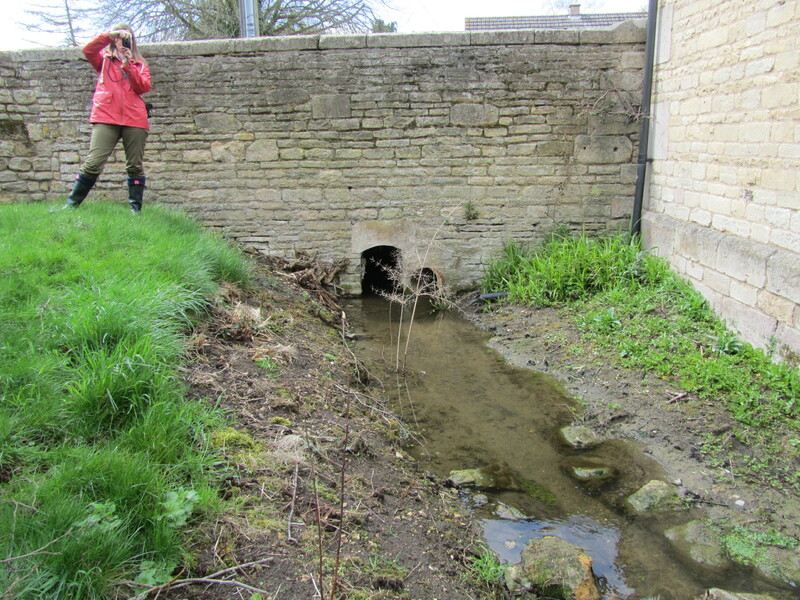 Manuscripts and printed sources from the period when the canal was operating give several references to bridges in West Deeping, but not one to a ford. 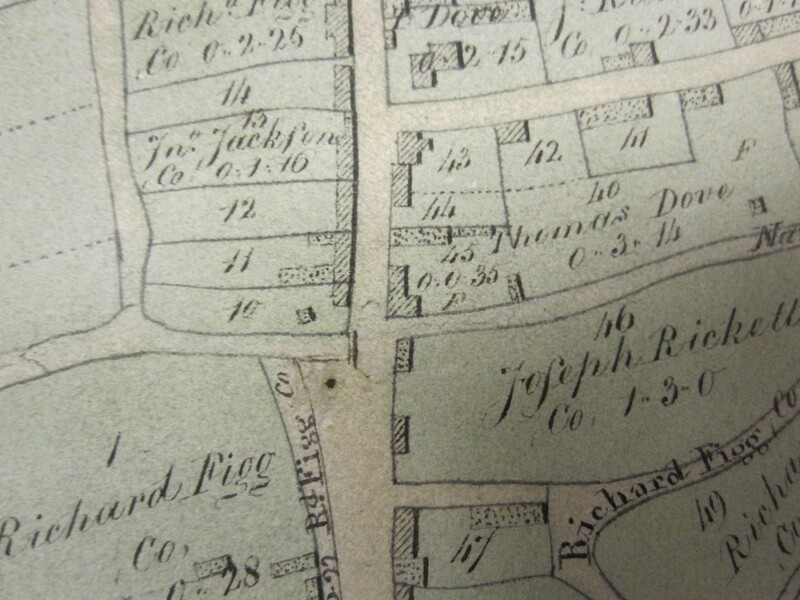 Amongst the several maps and plans of the canal that are large-enough scale to see the detail, there is only one – the 1813 Enclosure Award map – that indicates a ford, with a narrow bridge (likely to be a footbridge), on the west side of King Street. However, by 1861, there is evidence of a full scale bridge! 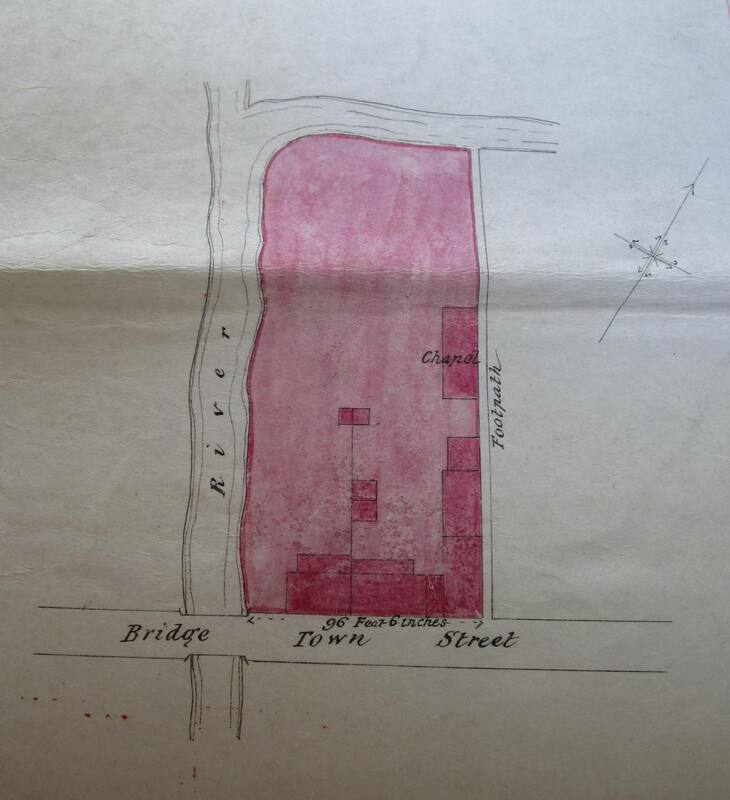 A map attached to the enfranchisement documents for the property next to the canal on the west side of King Street clearly shows a bridge. The waterway is labelled “River” and appears to going not only along the southern edge, but also along the western boundary. It may indicate some confusion on the part of the person who drew the plan – but there is no doubt that this property was next to the canal, and if the bridge were only a footbridge, it is unlikely to have been drawn as it is, across the whole width of the road. In 1865 when Stamford Corporation advertised the canal for sale, the bridge was differentiated from a footbridge, and their locations can be established by measuring out the number of yards listed in the sale particulars. Lot 15 was the lot extending from “the west side of the said Great Northern Railway to West Deeping Bridge including the Lock Pen and gates, in length 1552 yards or thereabouts, bounded on the north by the lands of the Earl of Lindsey and the Crown, an occupation road, and property belonging to Mr Sismore, and on the south by the estates of the said Earl of Lindsey, Mr Seth Smith, and the Rector of West Deeping” and this length of canal to the east of King Street is listed as Lot 16: “A further part of the canal extending from West Deeping Bridge to the footbridge in West Deeping aforesaid, in length 201 yards or thereabouts, bounded on the north by estates of the Rev Dove Jones and Mr Hetley and on the south by the estates of Mrs Addy and Mr Seth Smith.” The footbridge was near the farm buildings (now known as Manor Barn) belonging to Mr Hetley’s property, (now known as Cromwell House). We were able to match these written details with a copy of the conveyance of this section of the canal to Mrs Wright Hetley dated 1870. 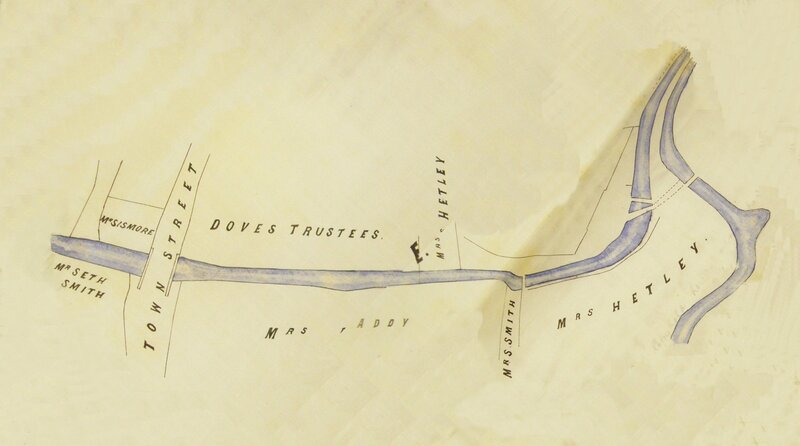 The map attached to the conveyance clearly shows a bridge where “Town Street” (King Street) crosses “The Navigation”. There appear to be three footbridges further east, the first leads to West Deeping Manor, the other two were for access to Mrs Hetley’s fields across the river. 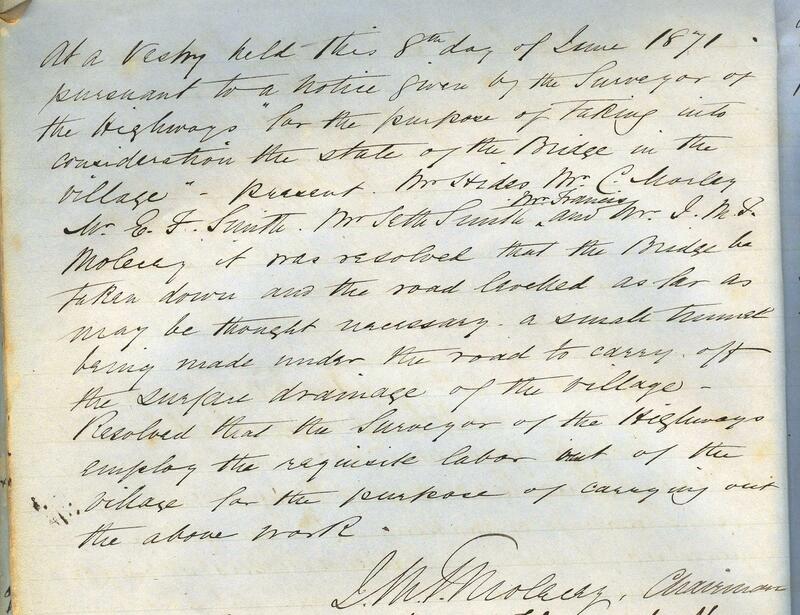 In 1871 minutes of a Vestry meeting refer to the removal of a bridge (they do not say whether it was a footbridge, or of what materials it was made) . They also refer to levelling the road but do not ever mention a ford or whether the road was being made up from the lower level of a ford. A small tunnel was to be “made under the road to carry off the surface drainage of the village“. It would appear from the evidence that we have found that the original stone bridge so-called in 1620 had been removed by 1813 when the Enclosure Award map was drawn and then replaced by 1865 when the canal was advertised for sale. The situation is now (2013) that the pavement on the east side of the road, up against Greystones, 45 King Street (thought to date from the late 18th century), is some 30 centimetres lower than the road surface, making it really difficult to envisage either a ford or a stone bridge. 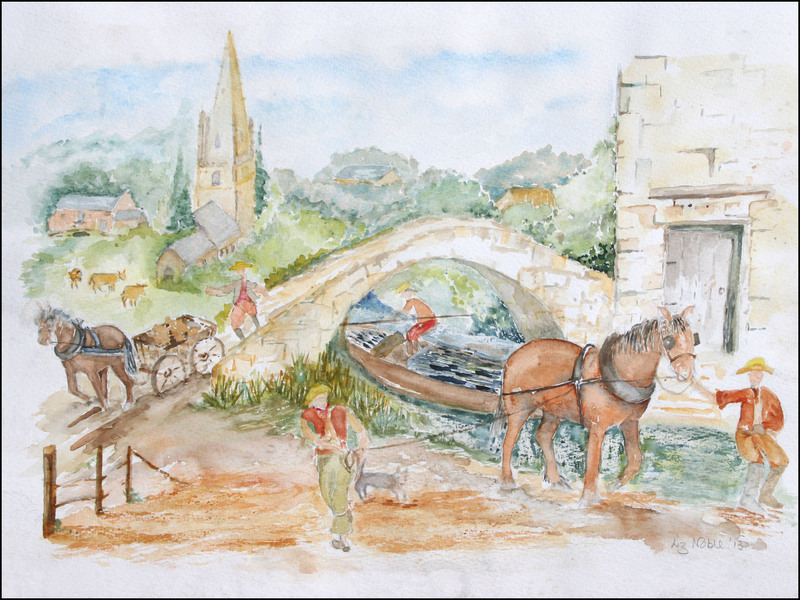 Inspired by the Boaty Story project, local resident and artist Elizabeth Noble painted a watercolour reconstruction of how a bridge might have looked. The ‘Boaty’ by Elizabeth Noble of West Deeping, 2013. A water colour painted during the ‘Boaty’ project. It is an impression of the working canal crossing King Street, West Deeping. The interpretation board at The Boaty on the west side of King Street at this point incorporates another visualisation. 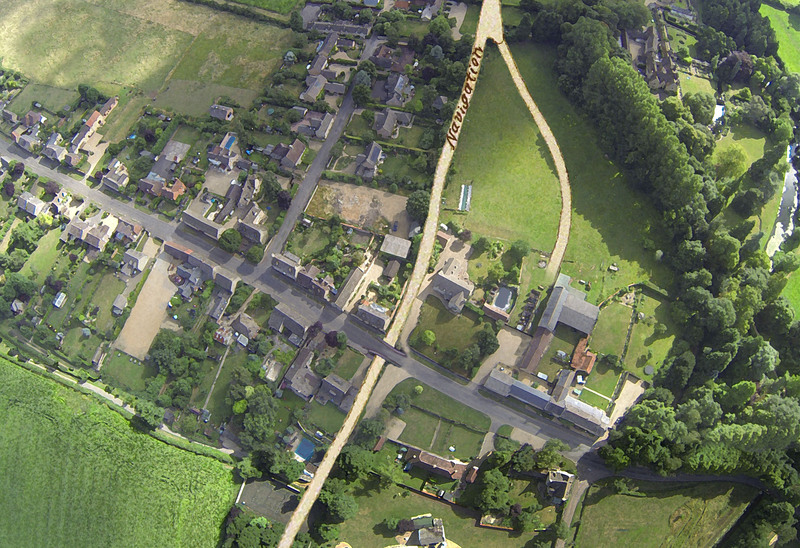 This is made up of a present-day aerial photograph on which the route of the navigation as shown on the Enclosure map of 1813 is superimposed, along with the image of a stone bridge. It remains a matter of some controversy and much conjecture!